You are currently browsing articles tagged RHS Chelsea Flowers show 2012. 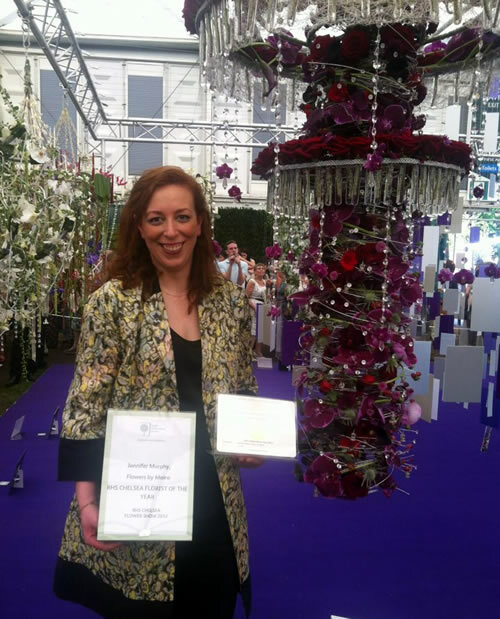 First time Chelsea competitor Jennifer Murphy walked away with a Gold Medal and the coveted title of RHS Chelsea Florist of the year. Jennifer travelled from Dunshaughlin in Ireland with all the parts of her design to compete at Chelsea. The brief was to create a chandelier to be hung at the Queen’s Jubilee dinner. The fabulous design contained 60 mini crown charms each embellished with a tiny button chrysanth to signify the Queen’s 60 year reign. Jennifer used roses, chrysanthemums, carnations, calla lilies, phalaenopsis orchids, eryngium, and hypericum, all in reds and purples to represent the royal colours. She made metres and metres of braided and crocheted silver wire and 500 diamante pins to decorate her chandelier. The design featured large rings of test tubes which mirrored the uniformed rows of crystals on chandeliers. The design was a staggering 1.85 metres in length when complete. Jennifer said she spent many hours preparing all the wire work for the design at home and then worked all night to finish it in time for judging. The hard work and preparation was definitely worth it, Jennifer’s design was a worthy winner. 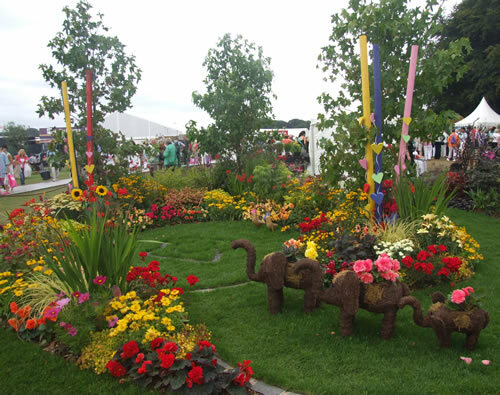 The Brewin Dolphin Garden designed by Cleve West has been awarded Gold medal and Best in Show. The garden features beech hedging with yew topiary shapes contrasted against herbaceous plants arranged in a loose layered style. The award for Best Fresh Garden went to The Easigrass Garden “Green with…” created by Tony Smith. 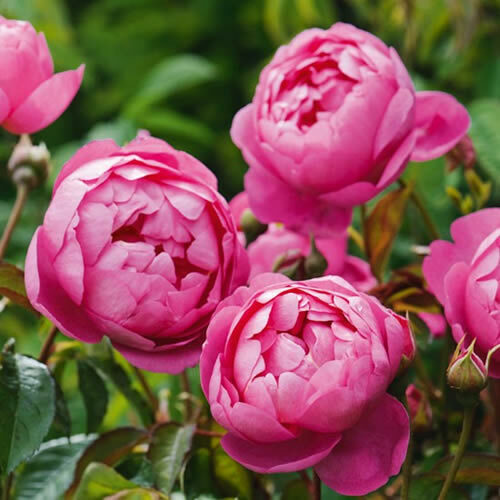 The garden explores envy and desire through plant history, colour and form. The main feature of the garden is a cage structure made from Perspex rods and poles. The cage represents a prison which houses orchids, tulips and ferns which have all been desired and envied throughout periods of history. Best Artisan Garden was won by Satoyama Life for The Ishihara Kazuyuki Design Laboratory Garden. The garden was designed by Kazuyuki Ishihara, and is inspired by the Satoyama which is the Japanese phrase for the area between the lowlands and mountains. The garden emphasises the importance of existing in harmony with nature. The main plants are acers and the garden features a thinning techniques used in Ikebana to highlight natural beauty. Thomson & Morgan were awarded Plant of the Year for foxglove Digitalis Illumination Pink. The pink flower with a hint of peach was bred by Thomson and Morgan to produce an exotic looking flower. The bee attracting plant flowers from June to November on multi-branching spikes. The Product of the Year award went to Harrod International for their Harrod & Slot Lock Framework building system. Their plant support consists of aluminium tubing which slots into locking connectors. The special Diamond Jubilee award went to H.W. Hyde for their lily display. The display was their first ever walk-through exhibit and featured hundreds of plants in three beds. The award was presented by HM The Queen. Sparsholt College gained the award for Best Exhibit in RHS Environment. Their exhibit promoted growing the maximum crop possible from the minimum space. This year the RHS Chelsea Flower Show has several special exhibits to honour the Queen’s Diamond Jubilee. The Queen is the show’s Royal Patron and has visited every year since 1971. The great Pavilion will show an exhibition of photographs of the Queen at Chelsea show. The images have been collated from the archives of the RHS Lindley library and will include photos from the Queens earlier years through to her recent visits. The RHS holds a collection of Royal Autographs on botanical artwork. Two new autographs have been added to the collection this year, on display in the RHS Life section. One signed by the Queen and the Duke of Edinburgh and one signed by the Prince of Wales and the Duchess of Cornwall. The RHS has received royal patronage since 1816 and the collection celebrates this royal connection. A large floral bed has been designed to welcome the Queen to Chelsea in her Jubilee year. The exhibit by St Helier, Jersey features summer flowering plants in a three dimensional design and a rotating Jersey Accession stamp as centrepiece. Young people from around the country have grown a selection of vegetables and flowers for their Jubilee themed Generation Gardens. They feature root vegetables, petunias and gerberas in red, white and blue. The two small gardens show how flowers and vegetables can be grown by anyone with any size garden. A special floral exhibit has been created for the Jubilee by NAFAS demonstrator Derek Armstrong and floral designer Clint Harrison. The large design at the centre of the Floral Design marquee portrays the Royal emblem and features 5ft lions and unicorns. The centrepiece is the Royal Crown made from plants and flowers and adorned with diamonds. The floral design competitions are Jubilee themed this year. Diamonds are forever is the title for the Chelsea Florist of the Year and Young Florist of the Year. Contestants have created chandeliers for the Queen’s Diamond Jubilee Dinner. The NAFAS exhibits are themed to honour the Queen’s Jubilee this year too. The large displays are have been created by several NAFAS clubs. Several trade stands are celebrating the Jubilee with their exhibits, offering special Jubilee themed products and ranges. Some nurseries have named new plants to commemorate the Queen’s Diamond Jubilee including two begonias and three sweet peas. For five days the grounds of the Royal Hospital are transformed into RHS Chelsea Flower show. Sprawling over a massive 11 acres, the show promises to be a feast for the senses. 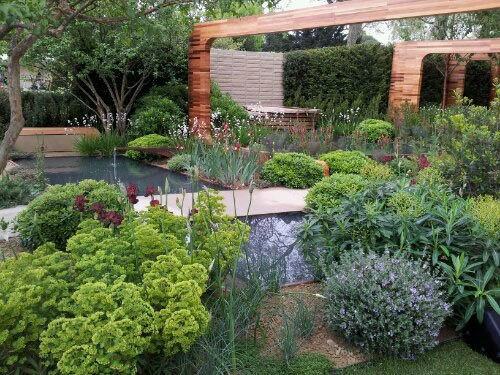 Gardeners, growers and designers from around the world visit Chelsea to see fabulous show gardens, breath taking flowers and the latest trends for the home and garden. Chelsea officially starts next Tuesday and runs through until Saturday. The recent wet weather hasn’t put visitors off; all 157,000 tickets from the RHS are sold out. Some tickets are now being sold online by ticket touts for up to £300! If you haven’t managed to get a ticket, follow the TV coverage which starts with a sneak preview on Sunday at 5pm on BBC One. 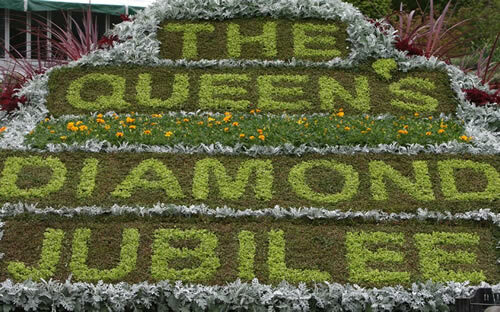 The Queen will visit the show on Monday to view the special exhibits designed for her Diamond Jubilee and new plants named after the Royal family. There will also be an exhibition of photographs of the Queen at Chelsea and a flower bed commissioned for the Jubilee. There are 16 show gardens this year created by some of the world’s best designers. Andy Sturgeon is designing an arts & crafts garden for the show sponsors M&G Investments. 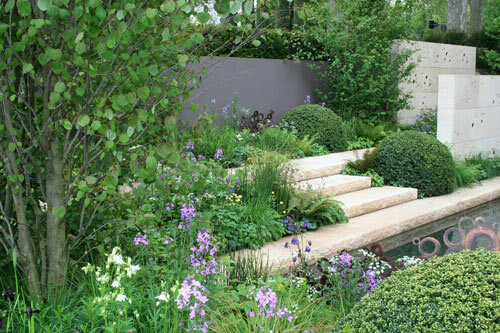 Cleve West, who won Best Show Garden last year is designing a topiary based garden for Brewin Dolphin and Joe Swift is designing the Homebase Teenage Cancer Trust Garden. Chelsea is using QR technology (quick response) for the first time this year; the gardens will have a QR code allowing visitors to view further information on each garden. There will also be a QR code garden featuring a large QR created with clipped topiary planted in a vertical wall. One of the new categories tipped for big things is Fresh, it challenges designers to come up with inventive and ground breaking designs, without the usual constraints of a show garden, the only limitation is plot size. Tony Heywood and Alison Condie, are the artists in residence for Chelsea 2012, they are creating a Fresh garden named Glamourlands: a Techno-Folly. 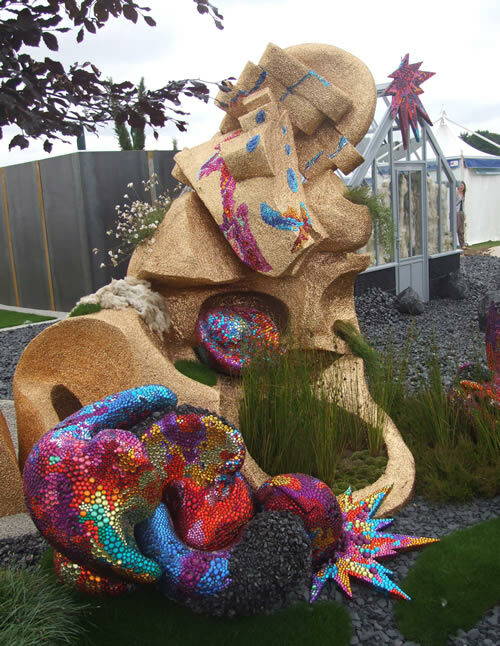 The garden is an evolving piece first seen at Tatton Flower Show in 2010. It’s based on an abstract representation of the Dorset coast and it is covered in thousands of brightly coloured jewels. Also new this year will be five Artisan Retreats, the small garden huts will be decorated by top designers to show the creative potential for small spaces. The retreats have been designed by VV Rouleaux founder Annabel Lewis, Nikki Tibble of Wild at Heart florist, Orla Kiely interiors and lifestyle designer, Vicki Conran interiors designers and textile artist Kaffe Fassett. Chelsea also showcases the best of British floral design, hosting the Young florist of the Year competition and the final of the RHS Florist of the Year. 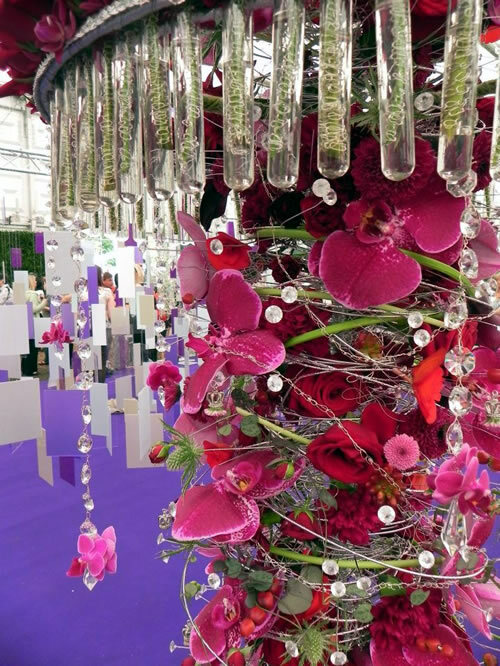 The Great Pavilion will feature some exciting exhibits including a life size Formula One car made from topiary, a Monet inspired floral exhibit and Fencing displays by the British Olympic Fencing Team.